Director of the Pattanam Excavations and of the Kerala Council for Historical Research based in Thiruvananthapuram. The fourth season of the multi-disciplinary excavation undertaken by the Kerala Council for Historical Research (KCHR) at Pattanam in Kerala’s Eranakulam district began in the first week of February 2010 and concluded in the second week of June 2010. The Archaeological Survey of India (ASI), Thrissur Circle, was a collaborative partner, while a number of universities and research institutes in India and abroad extended academic support. This is a field report of the fourth season of the dig. Reconstructing life at Pattanam, as revealed by the material finds, was the primary objective. The other objectives of the season were to investigate overseas contacts, clarify the cultural sequence and estimate the extent of the Pattanam archaeological site. The methodology of excavation followed was ‘locus based,’ which distinguishes each activity-area/layer/feature/pit/structure (termed ‘locus’) on the basis of colour, texture, character and composition. The search was not for antiquities per se, but for activity contexts and their relationships. The Harris Matrix tool was used to ensure critical restraint over the digging and to systematise documentation. It also helped to examine, identify and interpret cultural strata based on the locus-wise distribution of artefacts. Four main trenches of 7 x 4 metres size, separated by 1.25 m baulks, were opened at the Padamadathil plot. Eight evaluation pits of 1.5 x 2.5 m were dug on the boundaries of the site to understand the variations in stratigraphy and the depositional history. Pottery: Pottery fragments, both local and foreign, continue to be the dominant cultural artefact, and during this season the local pottery sherds approximated a staggering two million. The obvious indication is dense habitation in the Early Historic period, as suggested by the abundance of finds in the corresponding strata. The small and medium sized terracotta bowls seem to be the most prevalently used since almost two-thirds of the rims obtained are of this category. Cooking vessels were fewer in number, going by the incidence of soot particles. The pottery carry the fingerprints of the ancient people of Tamilakam, and reflect their social and physical environment. It is an indicator of their mastery over tools, and their skills and cultural interactions. The diagnostic pieces (rim and base), those with designs, grooves or impressions, edge ground and those with other distinct features, are sorted, documented and conserved. On many Indian excavation sites the body sherds of coarse ware are usually discarded after weighing and numbering. But we have held them back. They can be made available for further studies and can be designed as mementos or reconstructed as museum exhibits. These hand-crafted antiquities deserve more care and respect. The imported and fine pottery assemblage comprises Roman, West Asian, Indian Rouletted Ware (IRW) and a host of other unidentified fine wares. The number of Roman amphora sherds and Terra Sigillata excavated at Pattanam continued to be impressive and its record as the largest assemblage of Roman pottery in India will have deeper implications in understanding the Roman role in Indian Ocean trade. This season alone brought forth over 2,000 amphora sherds. The West Asian assemblage consists of green-blue glazed Parthian/Sassanian ceramics (Turquoise Glazed Pottery) and torpedo jar sherds. Their number is around 1,400. According to West Asian expert Dr. Derek Kennet of Durham University, who visited Pattanam this season, the West Asian ceramic assemblage suggests the commercial significance of Pattanam during the Roman, pre-Roman and post-Roman phases. The chronology he proposes is from the 3rd century B.C. as indicated by 'fish plates' of the Parthian period, through the Sassanian period, to the 9th century A.D. If scientifically established it would unravel the Euro-centric notions that have tended to downplay the West Asian role in the maritime history of the Indian Ocean. The IRW also provides critical evidence to effectively challenge the Euro-centric perspective promulgated by Mortimer Wheeler. This ware illuminates the trade dynamics within India which contributed to the development of long-distance maritime trade. The stratigraphic distribution of IRW suggests that Pattanam had been a commercial site even before West Asians or Romans came there. The occurrence of IRW in the pre-Early Historic layers, provides an insight into the fact that trade was predominantly South Asia-based and inspired at this early time. Further, the dominant presence of IRW around the shores of the Indian Ocean may be instrumental in revealing the importance of Indian Ocean exchanges in the development of Roman trade. Pattanam is the first site on the West coast of India to provide such a large assemblage of IRW. This season alone produced over 2,300 sherds. When did human habitation begin at Pattanam? High-precision AMS 14c dating on charcoal samples reveals that it was in the Iron Age phase (around 1000 B.C.) that native settlement began here. This is further supported by the presence of Iron Age antiquities such as Black and Red Ware (BRW), red coarse ware and iron objects in the aeolian sandy layers at depths varying between 340 cm to 370 cm. This sherd was a reminder of the historiographic bias that has tended to overlook the ‘local’; the Euro-centric notions that treated the ‘local’ as inferior and early human interfaces as unilateral. This sherd and the material evidence from the early habitation layers of Pattanam can sketch afresh the evolution of Pattanam into a multicultural commercial site and its role in Indian Ocean exchanges. Metals: In metallurgy, Pattanam seems to have registered achievements that must have amazed the world. These could have begun in the Iron Age phase. It may be assumed that the expertise in iron technology soon extended to other metals, especially copper, gold and lead. Personal Adornment: Objects of personal adornment seem to have had a pride of place at Pattanam. Most of the copper and gold objects appear to be fragments of ornaments or cosmetic tools such as antimony rods. Lapidary items such as stone beads, cameo blanks, micro inlays, pendants and glass beads are substantial in terms of their quantity and variety. As in earlier seasons, the semi-precious stone debitage in the Early Historic layers implies that lapidary workshops were active at the site. The artisans of Pattanam seem to have been familiar with advanced stone-cutting technology. Cultural Sequence: Though aligned structural remains were not found this season, large quantities of related material such as brick bats, Early Historic and Medieval roof tiles, terracotta ring wells, soakage jars, and large quantities of iron nail were excavated. It is interesting that except for one intact corner tile and one triple grooved Early Historic roof tile, the whole assemblage of bricks and tiles were battered and fragmented. Did continuous activities of re-use or disturbance at the site result in so much debris? Or is it that this season’s trenches were dug where structures did not exist? Fortunately, the gross destruction somehow is confined to each cultural layer without confusing the cultural sequence. On the basis of the stratigraphic, artefactual and chronometric indications, five tentative cultural phases can be defined at the site - Iron Age [? 10th c BC to 5th c BC]; Iron Age - Early Historic transition [4th c BC to 2nd c BC]; Early Historic [1st c BC to AD 4th c]; Early Medieval [AD 5th c to 10th c] and Modern [AD 17th c to the present]. There is lack of evidence for habitation (probable desertion?) of the site during the 11th c to 15th c period. Broken Rim with Brahmi script: This rim sherd with pre-firing marks of four Brahmi letters was found at a depth of 138 cm. This find has a special significance considering the scantiness of inscribed potsherds at Pattanam. This is the first pre-firing pottery inscription from Pattanam, though some sherds with post-firing graffiti were found in the earlier excavations. The letters are identified as ‘daa’(?) ‘ta’, ‘ni’(? ), ‘ka’. Comparative study of scripts from contemporary sites in Tamilakam as well as the Red Sea port sites of Berenike and al-Qadim (Myos Hormos) may shed more light on this find. Does the dearth of inscriptions and graffiti on potsherds imply that the writing media were perishable materials like palm leaves or papyrus. It may be recalled that the AD 2nd century Muziris document, the legal contract between a Muziris merchant and a shipping agent, was on papyrus. An interesting find of this season in this connection was an iron stylus — ezhuththani or naaraayam. Botanical Samples: At circa 4 m depth, all the four main trenches had peat formation. Peat is a spongy layer of botanical remains deposited over a long period of time. Due to slow oxidation, the decomposition slows down and the plant sediments survive centuries, and subsequently transform into fossils. Peat was seen below the Iron Age layers and further down in the natural layers. Besides organic sediments such as roots, leaves, bark and seeds, the peat layer included frankincense. A team from Oxford University led by Professor Chris Gosden and Dr. Nicole Boivin that visited the site, opined that the organic preservation at the site is remarkable for a tropical context. The Oxford University has signed a memorandum of understanding with the KCHR which offers archaeo-science facilities for the post-excavation studies of the Pattanam samples. Eighteen wooden pegs of circa 15 to 30 cm length arranged elliptically at a depth of 4 m in Trench No XVIII was another important feature excavated this season. Dr. P.K. Thulasidas, Dr. Thomas P. Thomas and Dr. A.R.R. Menon, scientists from the Kerala Forest Research Institute (KFRI), Thrissur, visited the site to collect samples. Coins: About 40 coins, round or square in shape, were unearthed this season. Some of them are heavily corroded and all are made of copper alloy, except for one lead coin. Most are Chera coins with bow and arrow and elephant symbols from depths ranging from 140 cm to 250 cm in the Early Historic levels. These can shed light on the state and polity as well as market dynamics that prevailed during the Early Historic period. Foreign coins, however, are conspicuous by their absence. Research Team: The co-directors were Dr. M. Nambirajan (ASI), Dr. V. Selvakumar (Tamil University), Dr. K. Rajan (University of Pondicherry) and Dr. K.P. Shajan (United Kingdom). Dr. Preetha Nayar (KCHR) was the Antiquity Registrar. The trench supervisers were Dineesh Krishnan (KCHR), K.P. Rajesh (KCHR), Vijimol P.K. (KCHR), Abhayan G.S. (ASI), Ajesh Krishnan (ASI) and Madhavi K. (KCHR). 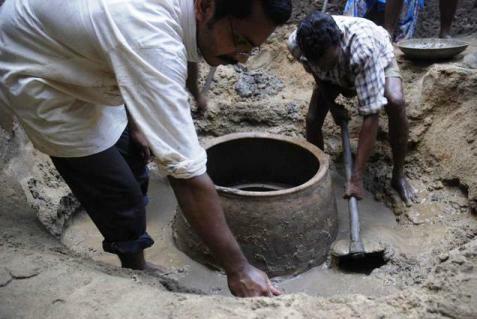 Vasudevan K. (KCHR) and Jaseera Majeed (KCHR) were in charge of pottery documentation. Smithi Nathan (Oxford University) and N. Krishnapriya (KCHR) were in charge of the collection of botanical samples and geological samples respectively. The drawing, sketching and conservation functions were by K. Lakshmi (ASI) and Sarath Chandra Babu. Survey and trench layout were done by L.R. Rakes (ASI). The photo documentation was by Photography Design students of the National Institute of Design (NID), Ahmedabad. The videography was executed by the Eranakulam unit of the Centre for Digital Image Technology (CDIT), Trivandrum. Students from the Universities of Oxford, Rome (Tor Vergata), Paris (Sorbonne), University College London (UCL) and various Indian universities participated in the excavations. A select number of school and college students were imparted training in the Field Archaeology School.